Bogdan Padalko discusses the Greek philosopher, Gorgias, drawing parallels between his oratory and the modern discipline of Economics. Vice versus virtue. Style versus content. Socrates versus three interlocutors. These are but a few of the themes which characterise Plato’s timeless classic dialogue, Gorgias. The dialogue is named after Socrates’ first interlocutor: probably the weakest and least significant of them. Yet the parallels which can be drawn between many of Socrates’ arguments and the modern-day realm of economic ‘science’ are striking – to the detriment of the latter. 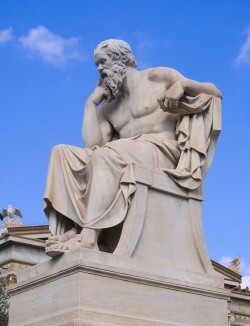 Plato’s Socrates came to is that rigorous academic subjects such as arithmetic or medicine are concerned with producing conviction through knowledge; oratory, on the other hand, involves a “sleight of hand” and produces false convictions. Such convictions are based not on knowledge, but on belief. It is up to the teacher to decide what is right and wrong, and to promote this via his speeches. Oratory was a crucial skill in the city states of Ancient Greece. A skilled orator could yield significant political power, their audiences being typically small but engaged. Morally ambiguous goals were often pursued; commanders, courts and councils could be influenced and exploited alike. Indeed, oratory was reliant on philosophy to guide its morality. Only then could it be used for good. How exactly does a two and half thousand-year-old dialogue possibly relate to contemporary economics? After all, economics is commonly perceived as a concrete science, based on rational, predictable individuals and statistical modelling. It is a discipline which has grown so complicated that it is now thought best left to the experts. Yet these experts have been proven wrong, time and time again. Much like the Athenian orators, economists have built a cult around themselves. Using this, they have, and continue to, shape the world around us. Much like the orators who were driven by some morally ambiguous goals, the church of neo-classicism serves to unquestionably justify the morally ambiguous policies of the establishment. This cult’s adepts are now trained in one influential school of thought – that of the Neoclassical. The individual is assumed to be rational and the discipline is guided by the idea of maximising ‘utility’, with the market left to the constraints of supply and demand. Only those who can afford to bid the highest will be accepted and will learn the truth about economics, which has turned into the ‘science of everything rational’. Much like the orators who were driven by some morally ambiguous goals, the church of neo-classicism serves to unquestionably justify the morally ambiguous policies of the establishment, exploiting its sprawling influence. Economists have managed to produce a false conviction that sustains their very profession: that economics is so complicated that it should be left to experts. Yet the fallacy of the ‘rock-solid economy’ reached its peak right before the 2008 financial crisis. Similar to the Greek orators, this very particular type of economics attempts to abstract itself from everything moral. Human beings are reduced to a variable in an equation, a plot in a diagram. Happiness can be ‘optimised’ and quantified. Economics yearns to be an objective science – the physics of the social sciences. What is economics ultimately concerned with? Of course, its subject matter is the economy: employment, trade, money, welfare, the way goods and services should be produced, incomes distributed and so on. However, unlike physical molecules, humans have their own free will and are by nature irrational. Thus, there are no ultimate truths in this area, no eternal facts, waiting for the keen economics ‘scientists’ to discover. Humans are by nature irrational, and have their own free will, unlike physical molecules. Even the most fundamental cornerstones of economics, such as the free market, have numerous political and philosophical constraints which are oft overlooked. For example, trade in humans is not allowed, from both moral and legislative perspectives, negating the sanctity of the free market in Neoclassical economics. Clearly, economics cannot, despite its claims, be completely impartial like the physical sciences can. What about the business cycle? You can model and predict and test what will happen. Just as if I pushed you, you move away from me – there are universally obeyed laws. The economy goes through peaks and troughs”. Nevertheless, the fact remains that there are numerous ways of thinking and explaining the business cycle, and we are still far from a set of some universally obeyed laws. Hence there is no one true way of studying economics. Yes, it can produce some positive evidence, but economics is by nature interpretivist. It is not an art, but what Plato calls “a knack”. A knack appears sophisticated and rational to the uninitiated, but is in fact a mere bluff, an illusion. It is hardly guided by rational theory (for instance, all the assumptions behind completely unrealistic models such as ‘perfect competition’). It is in its current, corrupted form, designed to please the ever-growing hedonism of the consumerist crowd, and to call it a ‘rise in the living standards’. The most striking thing about Gorgias, and Ancient Greeks in general, is how relevant a lot of their ideas are, or how little we have really changed in the past two and half thousand years. Rather than try and argue about which school of thought is ‘right’ or ‘true’, we should argue which is the most appropriate one in this particular situation. We should look at economy from different perspectives – Marxist, Institutionalist, Behaviouralist to name but a few – and not through a fixed prism of Neo-classicism. 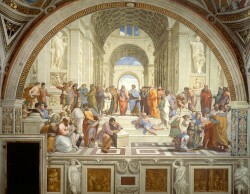 We should adopt the Socratic method and question our actions for the sake of mutual enlightenment. This will permit active, engaging, solution-oriented economic debates and policymaking, rather than letting the ivory tower of experts decide.